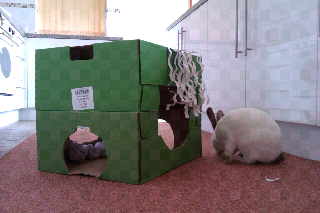 Speedy the cheeky house bunny: Speedy's cardboard activity centre! Here's Speedy's other new toy,a cardboard activity centre.With all the bad weather that we have been having Mum has been trying to make me new things to stop me from getting bored when I have my playtime inside.First dad made me a stick hidy tunnel then mum made me a red scarf to play with thanks to Lorna's idea in her story,then mum made me my paper snow balls and then she turned my hidy box into a activity centre with funny things hang off it and more paper snow balls inside it too! 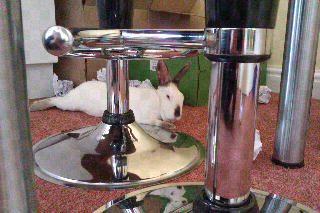 And this is me pooped out from playing! what an ADORABLE idea!! It could be used for kitties too!!! I think cody would love it! My goodness but they keep you hopping. 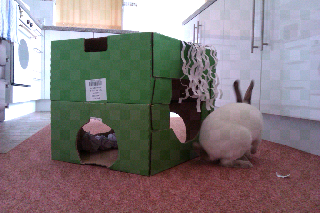 Good you get some down time Speedy! Don't worry RG I get plenty of down time too! I think you are very talented your self and you would probably make a better one...TeeHee!